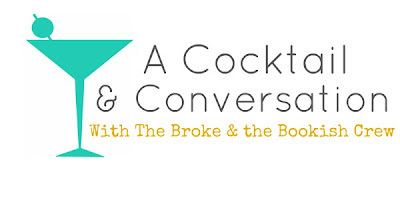 It's been a couple of weeks since our last edition of Cocktail and Conversation. Pour yourself a drink, pull up a chair, and let's chat. Lori says: I love our back porch. My boyfriend and I sit outside on the back porch for hours, just chilling and having a couple of beverages. I also love doing yoga, eating, and reading out there. I bought a lot of plants and flowers to cover the porch this spring, which makes it just lovely. Jana says: My favorite spot in my house is my bedroom. I just re-did the entire thing last summer, so I've got a book nook and tons of bookshelves, a really comfy chair with throw pillows and soft blankets, and a cute little lamp that puts off the coziest warm light. I love spending my time reading there or watching my favorite old movies. What about you? What's your favorite spot in your home? My favorite spot in my house is my little corner of the couch. I have a blanket that stays there so I can snuggle up and read a book. I may or may not have hidden snacks in the corner table too. haha! My favourit spot is the old couch in the corner of our huge balcony from March till october I'will start my day here with a big pot of coffee and a quick scan over the news of the night. My favorite spot is my computer room where I have my TBR shelf and my funkos. I love my bed, even though it’s been giving me a backache lately. The porch is nice, too. I get to hang out with the dogs and the sunflowers.